Th-INK-ing of You: SSCC Plans for You! Hello Everyone!! Today it is time for another Stampin Sister in Christ Challenge and Chris is our hostess this week. Psalm 139:13 For you created my inmost being, you knit me together in my mother's womb. I praise you because I am fearfully and wonderfully made: I know that full well. Her challenge is: Use the talents you have been given to create a card or project that is knit together (stitched- faux or real). What a great challenge and verse! It is amazing to realize that God formed every part of us for a distinct purpose, and He makes no mistakes! We are fearfully and wonderfully made!!! Have you ever wondered at the miracle that healing from every day scratches and colds really is? God made our bodies with incredible healing abilities! Think about the miracle of birth... it still amazes me to see pictures of a very young fetus... at a very early term, that baby is all there... fully visible and functioning.. and just the way God planned! I decided to use Our Daily Bread designs May release set, "For the Graduate", choosing the Jer. 29:11 verse to go along with the thoughts on God's plans for each of us. I also used the Iron Works Borders set and cut out two. I am also entering this in the Totally Gorjuss Challenge - stitching. Paper: Papertrey, Making Memories, The Paper Co. Accessories: Spellbinders Fleur de Lis Pendant die, Anna Griffith brass embossing template, Silver Embossing Powder and heat gun, Silver thread and sewing machine, Silver edged sheer white ribbon, tiny white flowers from the Bridal dept. in Michael's. If you create a card or project for this challenge, please leave a direct link here. Be sure to include a direct link to Stampin Sisters in Christ. Should you upload your creation to SC or PCP, please use the keyword SSIC37. This is stunning Grace!! I just love your scripture choice, the paper, the embossing, the flowers and your creative stitching. You never cease to inspire me my friend!! Awesome inspirational card and take on the challenge. 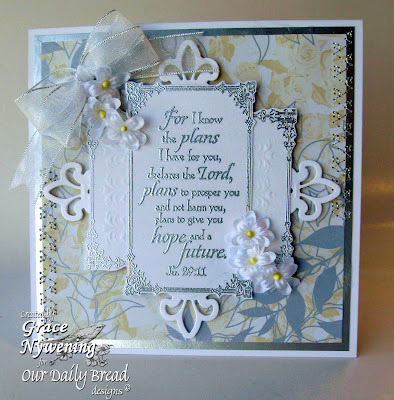 This is beautiful Grace.. your embossing makes it so rich looking.. I love the scripture too.. Great job. Have a terrific Sunday.. Coffee soon.. Gorgeous!!! Oh my word Stunning! This is beautiful Grace, the embossing in solve is such a great accent for the paper colors, not to mention the stitching! Lovely card for a graduate or anybody! Breath taking! The embossing is gorgeous, and so is the sewing. Loving all of that silver! Grace, I love this card. The embossing is beautiful! So very beautiful, Grace! You details are always amazing! A favorite scripture of so many people and how beautifully you have displayed them. That is such a wonderful card with the scripture being the focal image. The layout is beautiful and the DP is perfect with it. Love it! Oh Grace - this is just so, so beautiful!!! Love the soft, delicate elegance and all the gorgeous detailing that you always add to your cards!! This is SOOOOO beautiful! Love these sets and your creations are GORGEOUS! Elegant.. Love the design and those flowers. Another favorite verse :D Love how you framed it and used the fleur de lis on the four sides and the little white flowers are a perfect touch - not to mention the lovely DP. Great card.